Earlier this past week we celebrated the Annunciation which is both a Lord’s Feast and a Feast dedicated to the Theotokos. This Feast is not the only time in Great Lent we commemorate the Theotokos. There is a service held on each of the first four Fridays of Great Lent called the Salutations to the Theotokos (Χαιρετισμοί) and on the fifth Friday, the Akathist Hymn (Ακάθιστος Υμνος). The Akathist Hymn heard on the fifth Friday is the compilation of the previous four Fridays, now heard in its entirety. The Akathist Hymn is broken down into four stasis. The first stasis is dedicated to the Annunciation, the second for the Nativity of Christ, the third for Christ and the fourth for the Theotokos. Each stasis has 6 oikoi, each beginning with a Greek letter in alphabetical order. So for each stasis there are 3 long oikoi and 3 short oikoi. So the entire Hymn consists of the four stasis, the Canon dedicated to the Theotokos and the Small Compline. Both the Canon and the Small Compline are heard on all the Fridays and on the first Friday there is a Gospel reading. Before and after each stasis, the Kontakion, “O Champion General” (Τη υπερμάχω) is chanted. So why do we chant the Akathist Hymn every Friday? This has been a tradition for centuries. In the year 626, during the reign of the Emperor Heraclius, the barbaric Avars attempted to seize Constantinople. However, the Patriarch Sergius along with other clergy marched along the walls of the City carrying the Icon of the Theotokos, the Holy Cross, the robe of the Virgin and the Icon of the Savior made without hands. The Patriarch dipped the robe of the Virgin in the sea and the defenders of the City were able to push back the enemy. Suddenly, by the intercessions of the Theotokos, a massive hurricane occurred, destroying most of the fleet of the enemy and saving the City. That night the faithful prayed unceasingly, praising the Theotokos for Her intercessions. It is custom to stand for the entirety of the hymn, hence its name in Greek, means to stand. The hymn is chanted during Lent because the Feast of Annunciation always falls during Lent and because we beseech the Theotokos for Her intercessions to help us with our struggles. There were other occasions where the Theotokos protected the Holy City from pillage. In 655 and 705 the Theotokos through Her intercessions protected the City from the Saracens. In 718, Patriarch Germanus composed the hymn titled “O Champion General” (Τη Υπερμάχω). 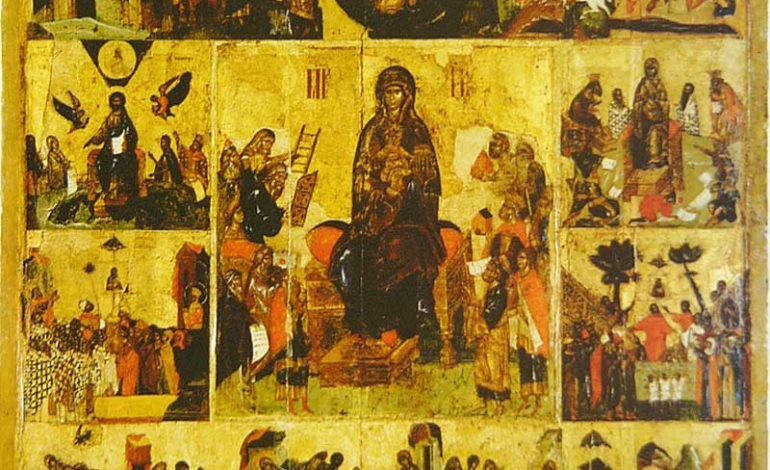 The Saracens, this time in overwhelming numbers tried to take the Holy City but once again the Theotokos through Her intercessions did not allow this to happen. This occurred on the eve of the Feast of Annunciaton in 718. The Theotokos, together with a multitude of the angelic hosts appeared suddenly over the walls of the City. The fleet of the Saracens was destroyed in the Aegean Sea by a great storm. It was for this occasion that Patriarch Germanus composed the troparion commemorating the Theotokos, “O Champion General.” This troparion is part of the entire Akathist Hymn plus it is chanted as a kontakion on the Sundays in Great Lent. As mentioned above, the Holy Cross was part of the procession along the walls of the City. This past Sunday was the 3rd Sunday of Lent, Veneration of the Holy Cross. The Church places the Veneration of the Holy Cross specifically in the midst of Great Lent because it represents hope and strength as we prepare to complete the second half of Lent. The Feast also reminds us that it is on the Cross that Christ redeemed mankind from sin and death. As we hear in matins on that Sunday in the Festal Kontakion: the fiery sword is not guarding the entrance to Eden anymore. For it was extinguished in paradoxical manner by the tree of the Cross. The sting of death and the victory of Hades have been stricken. And You, my Savior, came and cried out to those in Hades: Enter again into Paradise. The Cross is both our guide and our goal through this arduous journey. The Theotokos, through Her intercessions helps us and strengthens us. The Akathist is certainly a hymn of praise and thanksgiving but also one of supplication. We very much call upon the Theotokos for Her to help us, not just for Lent but throughout our lives. As She is known as the Protectress of the Holy City, She is also the Protectress for each of us; She is our Mother.